Polycom QSX improves productivity by addressing the content sharing needs of everyday meetings with up to 15 participant locations. Participants see content in one of two ways: QSX-enabled rooms see the content automatically though the room’s projector or display; locations without QSX can see the content through a standard, Java-enabled web browser. Polycom QSX is a new way of meeting and sharing content and is a natural extension of how people meet today in conference rooms – dialing the conference phone and presenting through a projector or VGA display. QSX is a small appliance that serves as a ‘hub’ for the conference room, connecting the conference phone, projector and Internet connection to enable high quality, secure and fast content sharing capabilities without adding more clutter to the table. This solution allows workers the freedom to walk into a meeting and immediately share their computer screen with remote locations without wasting valuable time on meeting set up. QSX addresses a market need in the conference room for ad hoc, everyday meetings. QSX is designed to be a versatile plug-and-play tool that anyone can use. Since the presenter connects simply with a VGA cable, anyone who walks into the room can present content instantly to everyone on the call, even if they are a visitor using a Macintosh without any individual access to the LAN. Using Polycom leading compression algorithms, QSX enables people to show virtually any type of computer content instantly and to show changes, or switch applications as the meeting progresses. The system also provides an integrated web viewer capability so participants in locations without QSX can see the presentation through a standard browser. The power of the Polycom QSX solution is in its simplicity, speed and the fact that anyone in the room can use it without downloading an application, calling IT for set-up support, or signing up for a service. QSX leverages a widely deployed phone platform to create a portal for content sharing through a conference call, without any additional cost. Polycom QSX is installed under the table, in a closet or on a wall in a conference room or office. 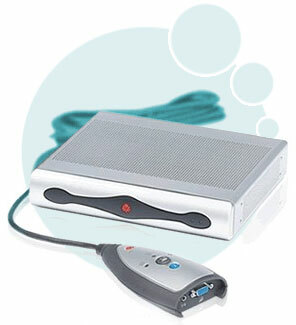 It connects a SoundStation conference phone (regular, analog phone line), an IP connection, and a projector or VGA display. Users simply connect their computer to QSX through a provided VGA cable, dial the phone and press the “content share” button on the content controller device to begin sharing. For QSX locations, the systems identify each other over the analog phone line and automatically setup an IPbased H.323 content sharing channel. QSX uses in-band, low-frequency signaling to send information over the phone line, which works in both point-to-point calls and through any audio conference bridge. Any one of the QSX locations can then present content at any point of the meeting by connecting a computer to the VGA cable and pressing the content button on the table. In viewing locations, the content is displayed automatically through the connected projector or display – no computer required. For locations without a QSX device, participants are able to view content through a web browser without having to download any applications or sign on to a service. Web viewer participants join by going to a URL provided by the QSX and entering the meeting password. All QSX sites on the call see the meeting web address (a QSX appliance IP address) and system-generated password on their local display. As compared to existing applications, the QSX web viewer facilitates ad hoc use by enabling people to see any type of content from a presenting location, without requiring users to pre-schedule or download any new software before use. A QSX meeting can support a total of 15 sites, more than enough to handle the average number of locations on most conference calls today. It supports a combination of up to five QSX systems and up to 10 web viewer participants. Adding value to 1.7 million conference phones - QSX adds a whole new dimension of visual communication to 1.7 million wired analog SoundStation conference phones in the market today by offering an integrated, upgrade solution for simple and secure content sharing. Every time someone uses the conference phone, they (or anyone in the room) can show content instantly, even if none of the remote participants have a QSX. Voice+Content enhances overall productivity in conference rooms, offices or from the road increasing customers’ return on investment in Polycom systems. Simple to use – Any existing SoundStation customer can now seamlessly add live content sharing to their meetings by deploying QSX appliances. With QSX installed, users simply connect their computer and dial the phone to display content on the projectors in up to five QSX-enabled conference rooms, and/or with up to 10 other remote meeting participants viewing through a web browser. Participants don’t need to download any applications or sign up for anything. Secure way to share content – QSX can be deployed behind a corporate can be encrypted on QSX to QSX calls, and the presenter maintains complete content flow without any risk of unintended document distribution. Cost effective – QSX ease-of-use saves users time and minimizes training expenses and ongoing IT support. In addition, since there are no service fees, QSX provides low total cost of ownership. Flexible – QSX supports up to 15 participants (5 QSX sites and 10 web participants) and can be used in conjunction with voice conference bridges, outside lines, or PBX lines. Using Polycom’s standards-based H.263 technology (QSX to QSX), QSX enables customers to share any type of computer content instantly – even files or applications that could not otherwise be e-mailed or shared effectively using other applications. QSX can also be configured to allow web viewer access from outside the corporate firewall. Easy to set-up and manage – QSX is a plug-and-play appliance that requires a one-time set-up that can be done in less than 30 minutes. QSX can be remotely managed through a simple web admin page or through the Polycom Global Management System.